"If you do decide to spend a whole day on the isle of Capri Italia you will have enough time to roam around the island and enjoy some of its most stunning sights to see..."
Being a cruise guest from a ship docked in Naples or tendering in to Sorrento, you will probably decide to spend a couple of hours only in Capri Italia. In that case I recommend you focus on the Capri attractions in Capri town itself. However, if you do decide to spend a whole day there and arrive very early, you will have enough time to roam around the island and enjoy some of its most stunning sights to see. Some of these sights on the isle of Capri Italia can be reached by a taxi or a bus (Anacapri, Marina Piccola) while others are best reached on foot (Villa Malaparte, Natural arch). 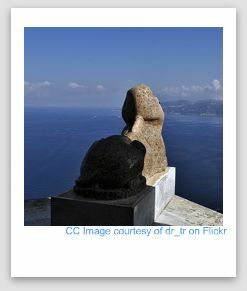 We suggest you decide which sights attract you most and then get a good map from the Tourist Info office in the Marina Grande of Capri Italia, and find out how to reach them directly. 1. ANACAPRI - Anacapri is the second biggest settlement on the island, and not so infested with ‘the glamorous scene’ as Capri town is. Some of the Anacapri attractions include the Casa Rossa, a building that stands out with its Pompeian red façade. Once it was home to an American colonel, John Clay H. MacKowen, who made Anacapri his home but today in Casa Rossa visitors can see the permanent exhibition of paintings glorifying the beauties of Capri island as well as Roman statues found in the Blue Grotto. The Church of San Michele in Anacapri is famous for its beautiful majolica floors showing the scene of Adam and Eve’s expulsion from Eden. 2. 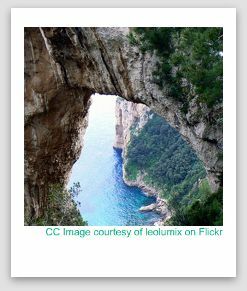 NATURAL ARCH (Arco Naturale) - is another one of the natural attractions that Capri Italia is so rich with. It is thought that this rock formation is a product of the collapse of a cave in prehistoric times. 3. VILLA MALAPARTE - was built in 1936 by the writer and journalist Curzio Malaparte on a dangerous cliff 32 (104 feet) meters above the sea. This modernist house stands out with its red façade, untypical of the island setting, and its reverse pyramidal stairs leading to the roof patio. It also featured in Jean Luc Goddard’s movie ‘Contempt’ (Le Mepris) starring Brigitte Bardot. Today, the house is used for cultural events and exhibitions. 4. VILLA JOVIS - is the most important of 12 Roman imperial villas whose remains can be found on the island. It was built for Tiberius in the 1st Ct A.D. and covered an area of 7000 sq meters (23 000 sq feet). The villa featured the imperial quarters, water cisterns, baths, the lighthouse, the loggia belvedere that the emperor used for his strolls and the observatory where Trasillus, Tiberius’ astrologer, studied astrology. Popular traditional tales say Tiberius used to hurl those who offended him to death from the cliff on the edge of the villa. 5. VILLA SAN MICHELE - is one of the biggest attractions of the isle of Capri Italia. Its construction began in 1896 on the remains of a Roman imperial villa that was preserved in the garden by the owner of villa San Michele, Swedish physician and writer Axel Munthe. The villa San Michele was built primarily to house Munthe’s collections of Roman, Etruscan and Egyptian finds as well as to enhance the already beautiful setting and impress visitors. 6. THE BLUE GROTTO - is probably the most famous natural attraction of the isle of Capri. Read about this enchanting cave in our article on Visiting the Blue Grotto. 7. VILLA DAMECUTA - was originally one of the villas belonging to emperor Tiberius. There isn’t much left of the structure as it was destroyed in the process of building fortifications during the times of French and English rule. Rare findings on the site testify to the rich décor of the villa in Roman times: marble floors, stucco work, decorations and works of art it was adorned with. 8. VILLA LYSIS - also known as Villa Fersen, was built in 1905 by a Swedish-French count, poet and painter Jacques Fersen. This romantic residence was built as a mixture of a Greek classical temple and a Libery style villa. There, count Fersen, one of the most eccentric visitors to the island could retreat from the scandals he was involved in. 9. MONTE SOLARO - The summit of monte Solaro is the highest point of Capri (589 meters/2062 feet) and provides breathtaking views over the bay of Naples and Salerno. 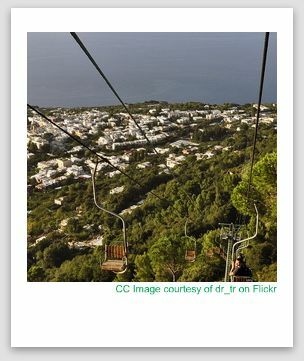 From Piazza Vittoria in Anacapri there is a chairlift service (12 minutes) but many visitors will choose to walk back and take time enjoying the views. 10. MARINA PICCOLA - or the ‘small harbour’ is part of the Capri coast that developed around what used to be an ancient Roman dock, and overlooked by the tower that was used as a watchtower at the times of the Saracen attacks. One of the ways to reach Marina Grande is by the famous Via Krupp which begins by the Augustus Gardens in the town of Capri. In the Marina Piccola area is the famous Mermaid’s Rock, what was believed to be a place where, in mythical times, the sirens seduced seafarers with their song. ‘La Canzone del Mare’ in Marina Piccola was originally a small English fort later transformed into private residences and eventually into a high-society bathing place in the 50s and 60s.